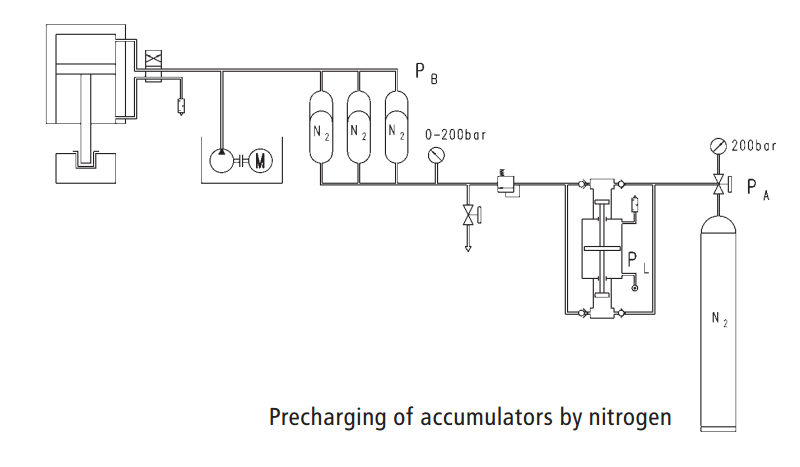 The Maximator booster’s operating principle is similar to a pressure intensifier. 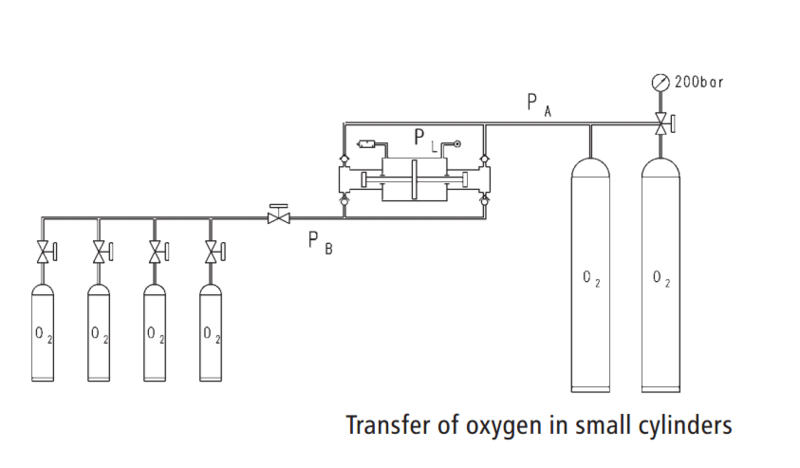 A large air piston is charged with low pressure (air piston (3)) and works on a small area with high pressure (hp piston (2)). 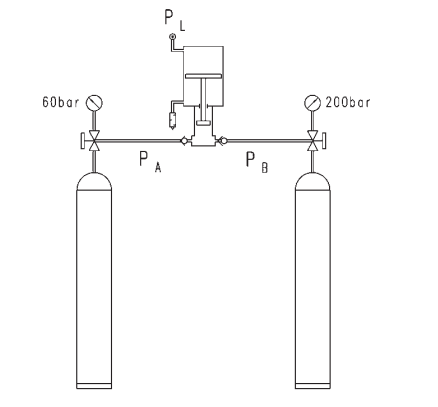 The continuous operation is achieved by a pilot operated 4/2 way valve (spool (4)). The spool leads the drive air alternately on the upper and bottom surface of the air piston. 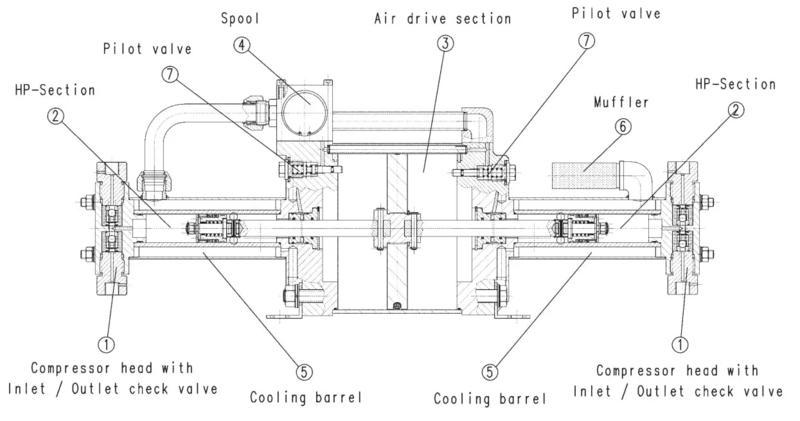 The spool is piloted through two 2/2 way valves (pilot valves (7)) which are mechanically actuated through the air piston in its end positions. The pilot valves charge and discharge the spool chamber. 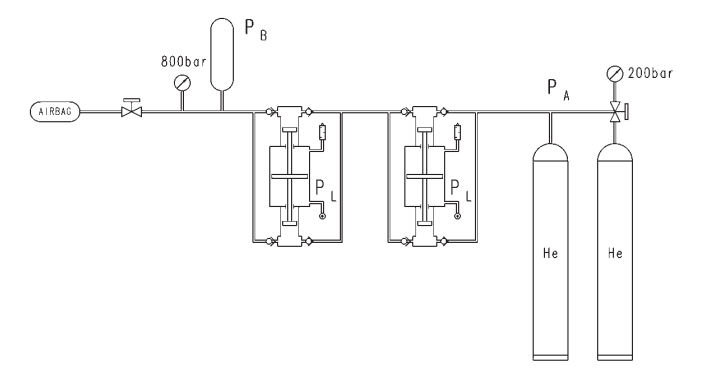 The hp piston supported by the check valves (inlet check valve and outlet check valve (1)) delivers the flow. 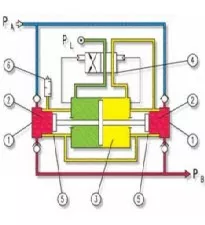 The outlet pressure is directly related to the set air drive pressure. 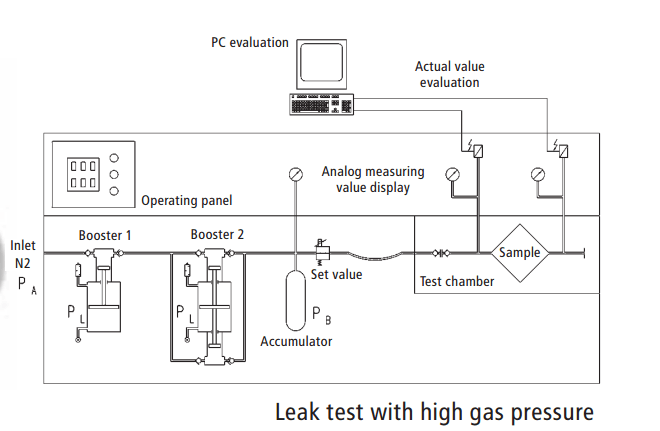 According to the formulas indicated in the table with technical features of the boosters, the static end pressure can be calculated. 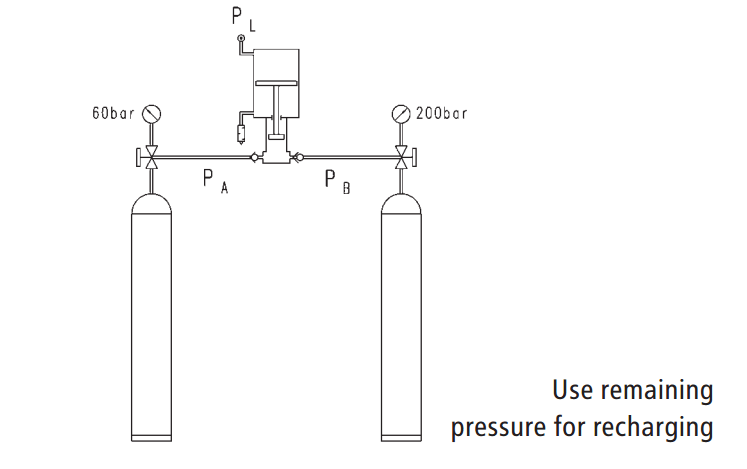 At this pressure a force balance between drive section and gas section is achieved. The booster stalls when this end pressure is reached, and does not consume any further air. 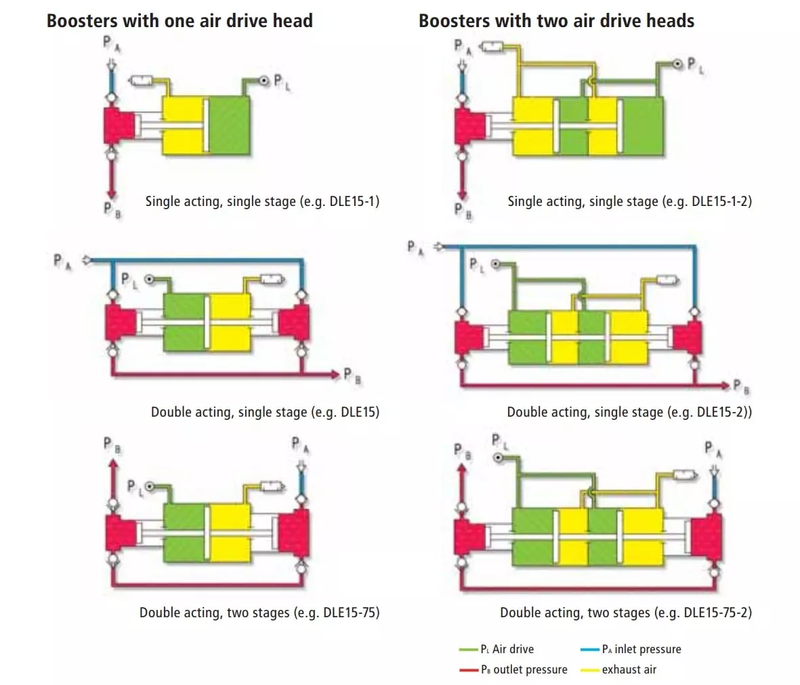 A pressure drop at the high pressure side or a pressure increase at the drive side starts the booster automatically until the force balance is achieved again. Additionally the MAXIMATOR boosters can be switched on and off automatically through MAXIMATOR air pilot switches, contact gauges or external control devices.